Spring is slowly making it’s way back into wild horse country. There is still lots of snow about, but the hillsides and valley bottoms are greening now. 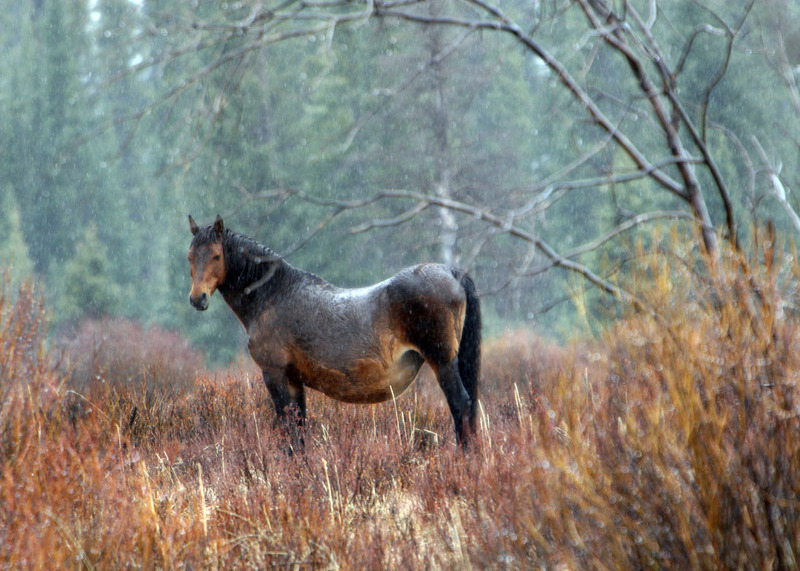 With that the wild horse herds have migrated down into these lower meadows so that the pregnant mares will have a place to graze and give birth to this year’s foals. 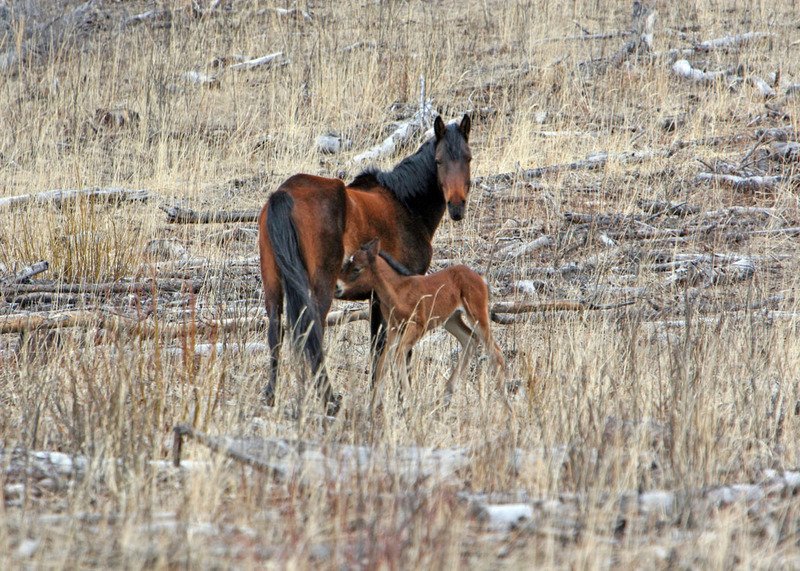 This year I saw the earliest born foal, January 23/11, born to a wild horse herd, (Yepa, above). 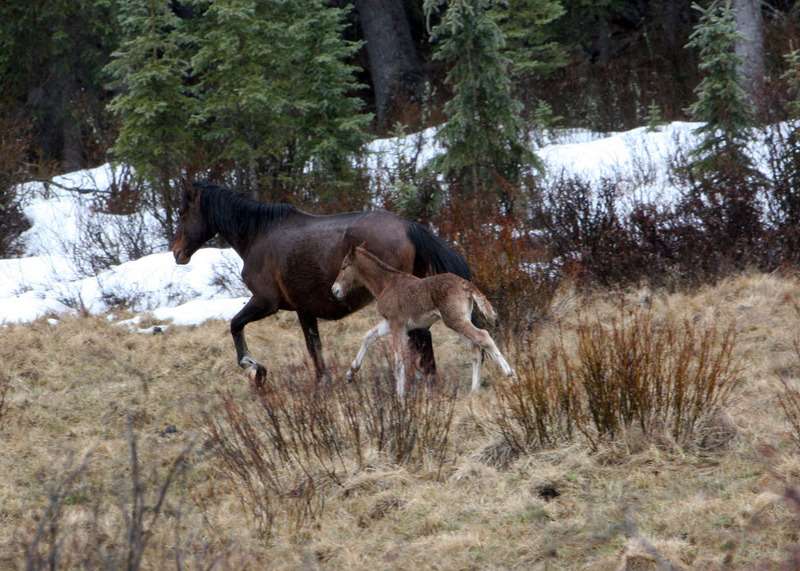 In March a mare in the same herd also had an early foal (Snowstorm, above). These two are now the best of buddies and are also close together. Snowstorm’s mom seems to have taken on the job of babysitting them both. Many other mares were still heavy in foal up to about two weeks ago. This past Sunday it was pouring rain but that is never a reason to stay home and besides my Akita’s needed a good run. Off we went with me vowing that I would stick to the main roads this time of year. 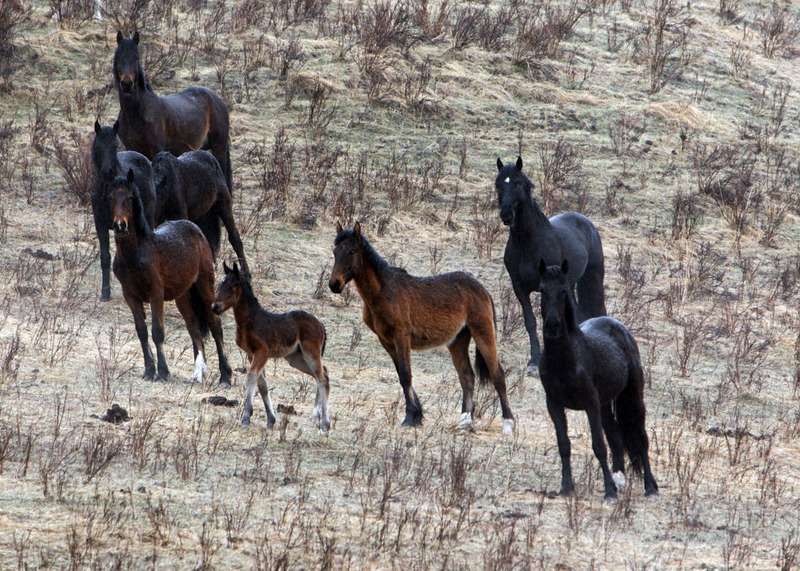 It was a pure joy for me to come across the herds we did, and to see the new foals some of the herds had with them. 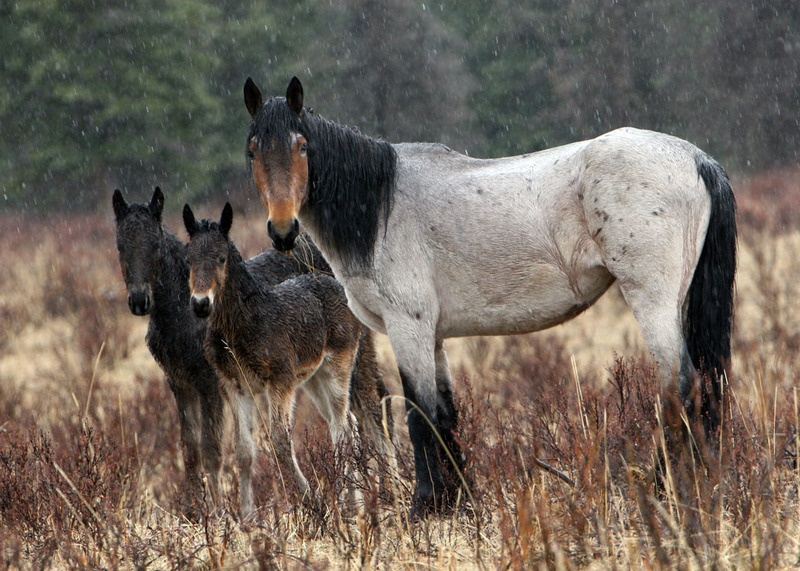 In the pouring rain and sometimes snow, I felt a little bit sorry for the foals as the younger ones would just stand close to the herd with their backs humped up trying to stay warm. 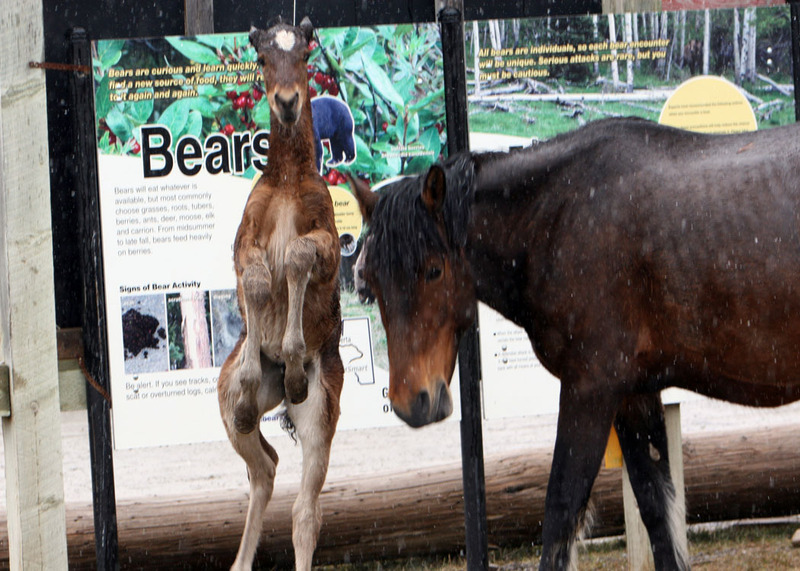 The foals that are two to three weeks old were not as perturbed by the weather and put on some hilarious antics pretending that they were as big and brave as the adult horses. They would go on alert and run to the front with the stallion or lead mare to see what the fuss was about. With the birth of the foals some of the herds are very wary and flee at the first sign of danger. We ran across this with one particular herd that has a white mare, (“Isatas”). I have found that the herds with a white gene prevalent in it, will always seem to be much more elusive. I believe this may be due to the way they stand out against the landscape. In her herd, that is sired by stallion “Chatan” there were two other mares with foals. 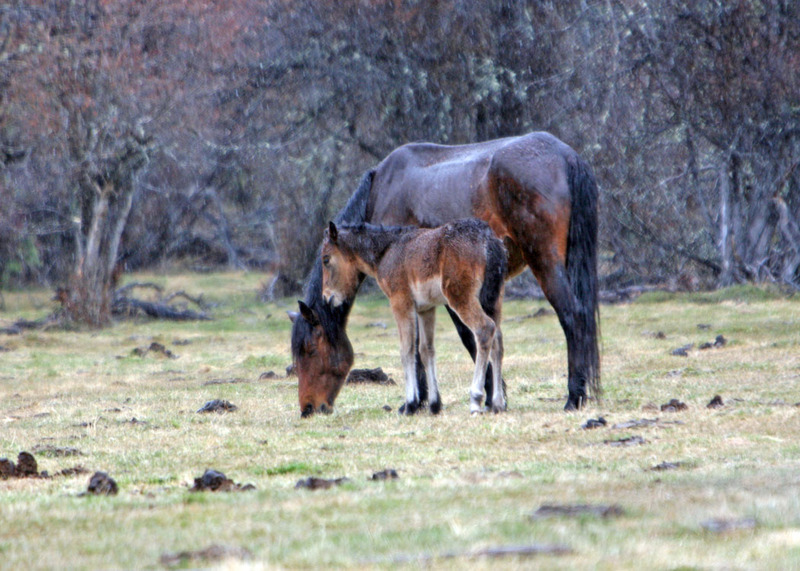 “Isatas” foal was completely black though, while the two with the other bay mares were the typical fawn color. As soon as they saw us the herd dashed off for the safety of the trees. 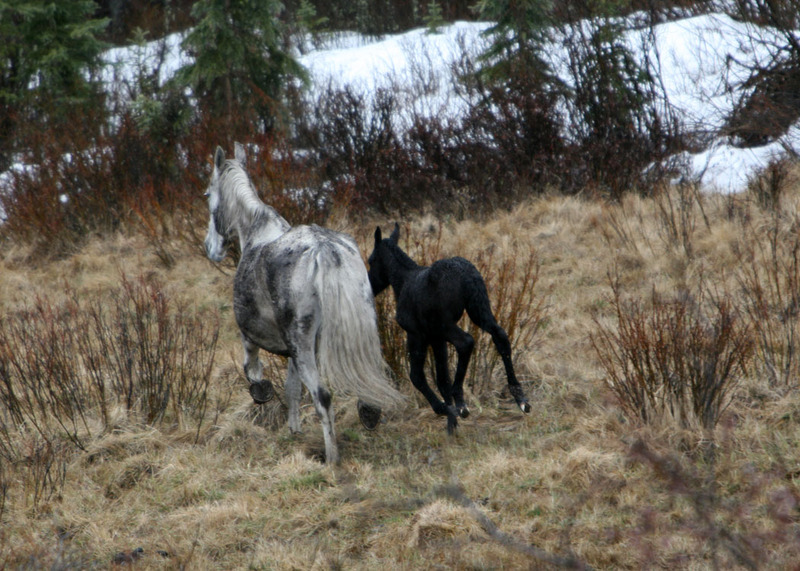 One little foal in the Kline Lake herd put on quite the show for us as it investigated a forestry warning sign, bugged it’s mom and then danced around in an effort to stay warm. 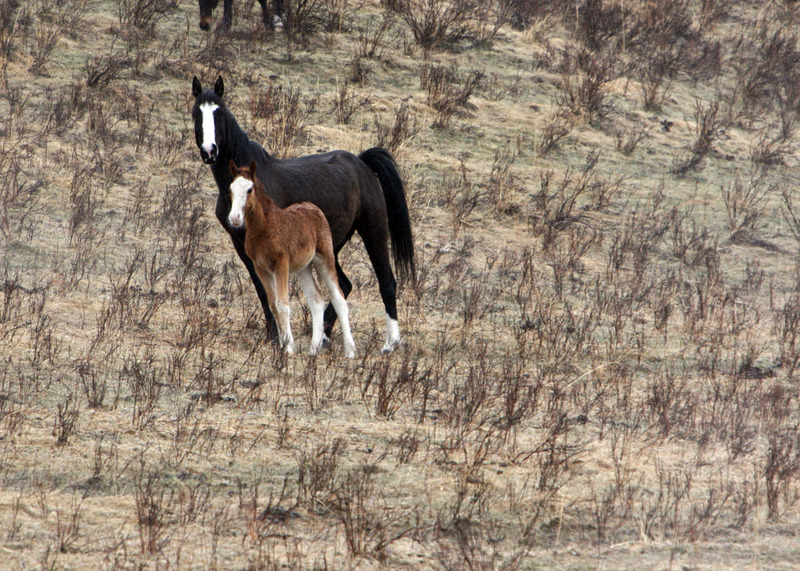 Even though the day was dismal with the rain, watching this little foal made the sun come out in my heart. 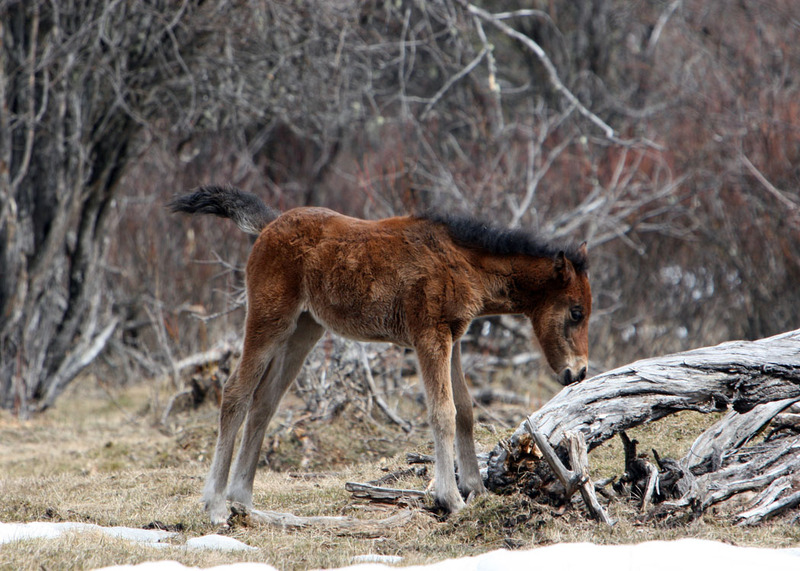 Then there was the other foal that was so busy and excited about investigating a log that it’s little tail was straight out quivering with excitment. The weather is supposed to warm up for awhile now and this will allow the foals already on the ground to strengthen and allow the mares still in foal to be give birth in warm sunshine. I will be out there again this week to check on them and to keep our members updated. I just need to get this baby on the ground to feel better. Thanks to all who continue to support WHOAS and the work we are trying to do to protect and save your wild horses.